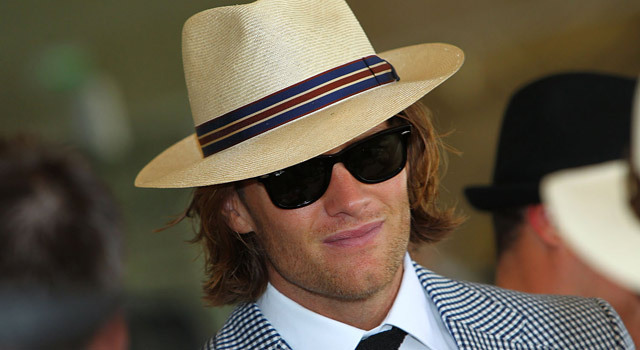 Published: Sept. 22, 2011 at 06:56 p.m.
Tom Brady is coming clean but will never admit that this was a bad look. Tom Brady is a liar. It is true. Brady admitted during a recent interview that he sometimes bends the truth because he does not want to go against the Patriot way -- and presumably to keep Tedy Bruschi from opening his mouth. "I don't often say exactly how I feel," Brady said. "And I don't often say exactly what I think. Because you don't want to cause controversy. When there is controversy, all your teammates start getting asked about 'What Brady said.' Really, it becomes a distraction to the team. You're trying to get ready for an important game on the weekend, and then now, on Thursday and Friday, the only thing that people want to talk about is some comment the quarterback on your team made." I feel for the quarterback here. I too often have to hold my words for fear of creating a controversy. I mean, I would love to tell you what I really feel about the Rams bolting from Los Angeles, but I am never allowed to bring it up. So with that in mind, I met up with Brady and conducted a fake interview with him to discover six truths that he has been dying to reveal, but hasn't had the courage to do so until now. That's right, long before he was known as the best quarterback in the NFL, Brady scored dates by telling girls he was Matt Damon. In fact, he admits, that is how he first landed Bridget Moynihan. Like who wouldn't get that premise? See, what happened on the island was real and everything else was fake. Or was it the island was fake, and everything else was real? Hey, maybe he didn't get the finale at all come to think of it. Brady loves playing quarterback, but he has often thought of a post-NFL career in film. And imagine his chagrin when his sideline home movies turned into a huge incident when the Patriots were accused of taping the other team's signals. Just look at the photos. Is there any way that you don't believe this to be true? But you have to admit, this is still much more manly than wearing UGG boots. Even if UGG boots are for men now (which they are not). Brady totally respects Eli and admires him for his courage and believes that he is a great leader for the Giants. Oh wait, just kidding, Brady doesn't have to lie anymore! Brady believes none of that and wishes that Eli would keep his mouth shut. But thought it was funny because it was created against the Raiders. More truths, Tom Brady said that he loved the Pick Six. Talk about it via Twitter or via Facebook. Be sure to catch the latest on the Dave Dameshek Football Program. "Six Seahawks draft pick do-overs..."